At the weekend, we went down south to stay with our friends, Emil and Richard. They live in Hemel Hempstead and we regularly go and stay with them for the weekend. In fact, last time we went down I made a little video on our stay, which you can see here. The reason for this trip was to celebrate their little boys second birthday. They had planned a party on the Sunday, so we decided to make a weekend of it and go down on the Friday night and stay with them for two nights. 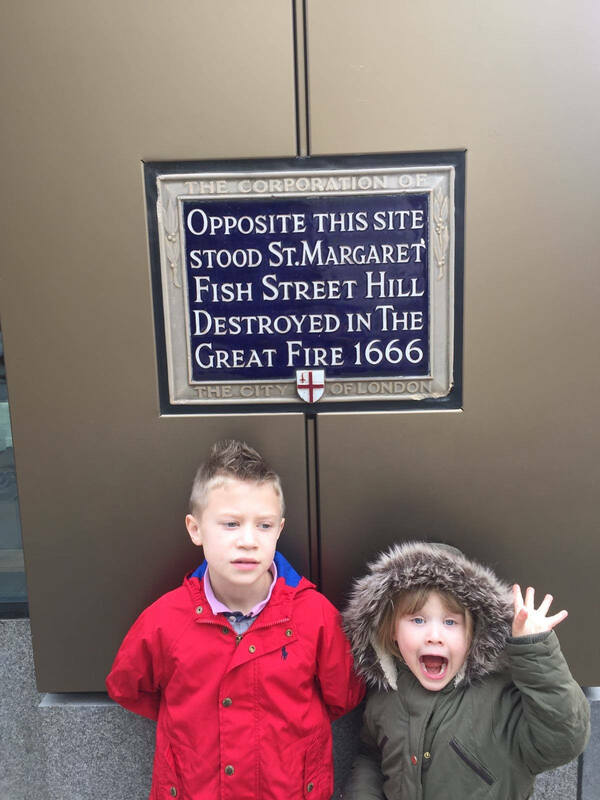 Oscar has recently been covering The Great Fire of London at school, so we thought it would be a great time to visit central London and see the sights. 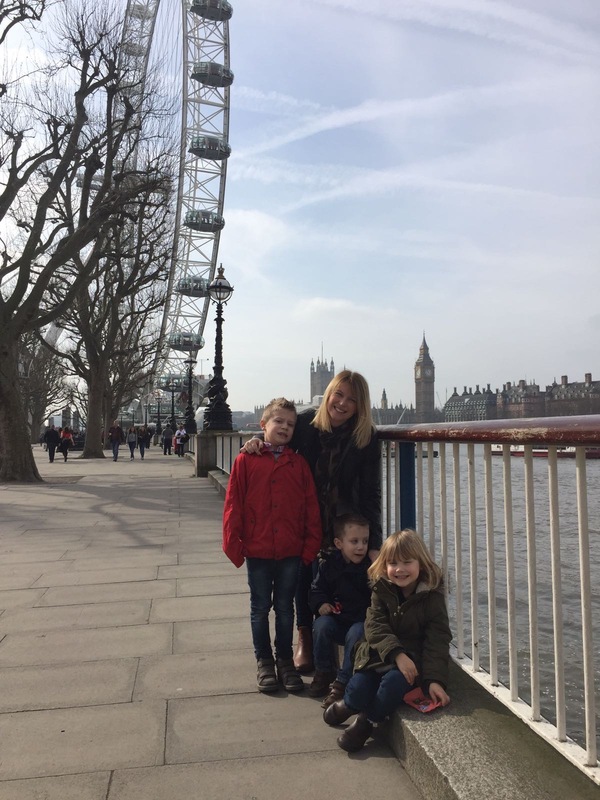 With the twins recently turning four, we hardly use the buggy anymore and it felt like the perfect time to see if their little legs would be able to survive a day of sightseeing. On the Saturday morning, we caught the train from Hemel Hempstead into Euston, which only took 30 mins. 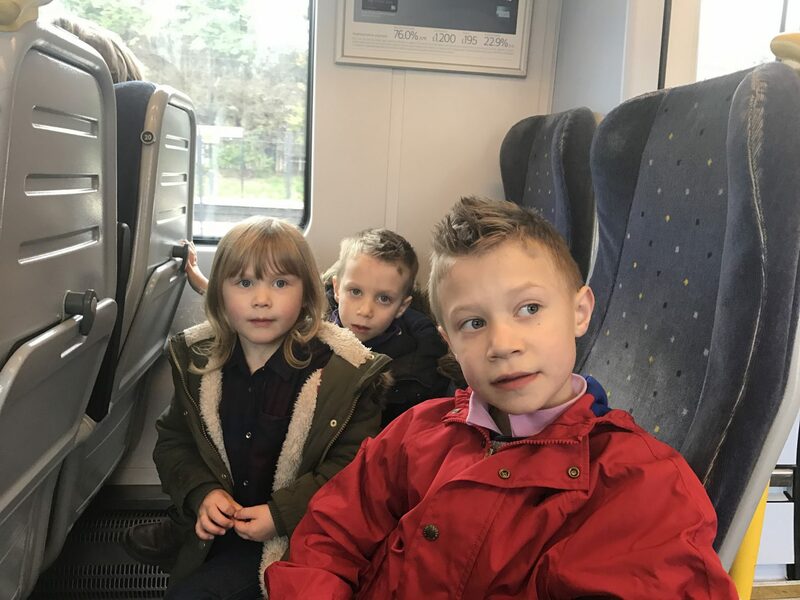 The kids were really well behaved on the train, which is always a nice start! 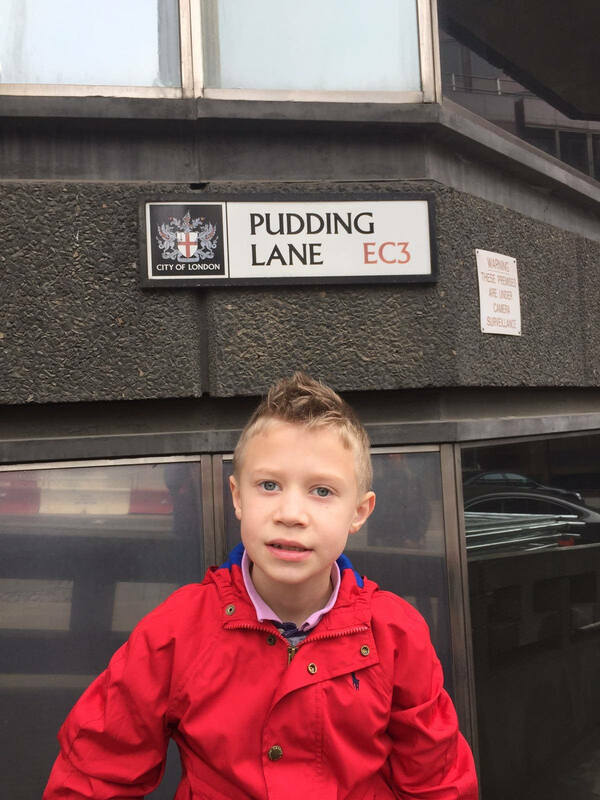 Upon arriving at Euston, we headed straight on to the Underground, as the plan was to go straight to Pudding Lane. However, we ended up at the wrong station. We were near the Thames and the London Eye, so we decided to have a little wander. The weather was bright and mild, so it was perfect weather for strolling along the Thames and taking in the London sites. 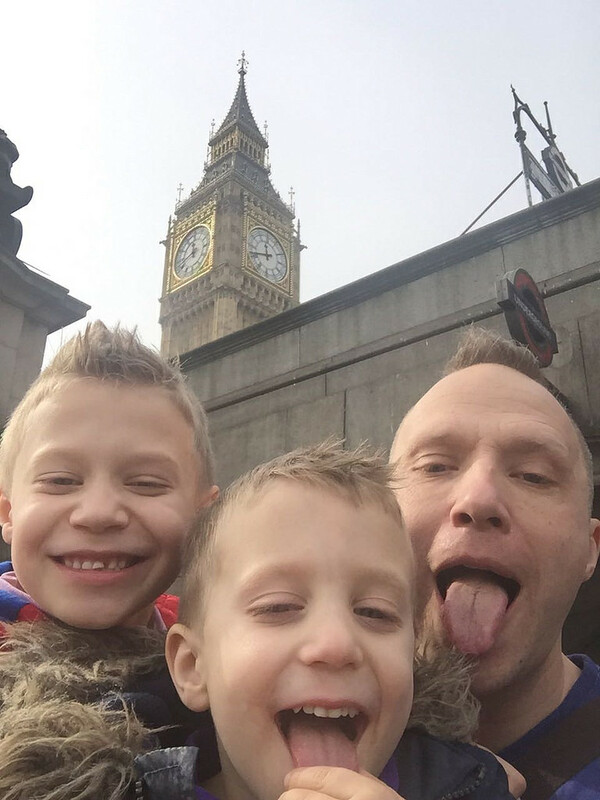 I’ve always loved London and often wished that Simon and I had gone to work there and live the London life for a bit before we started a family. I love the buildings, the pace and the feeling of possibility. 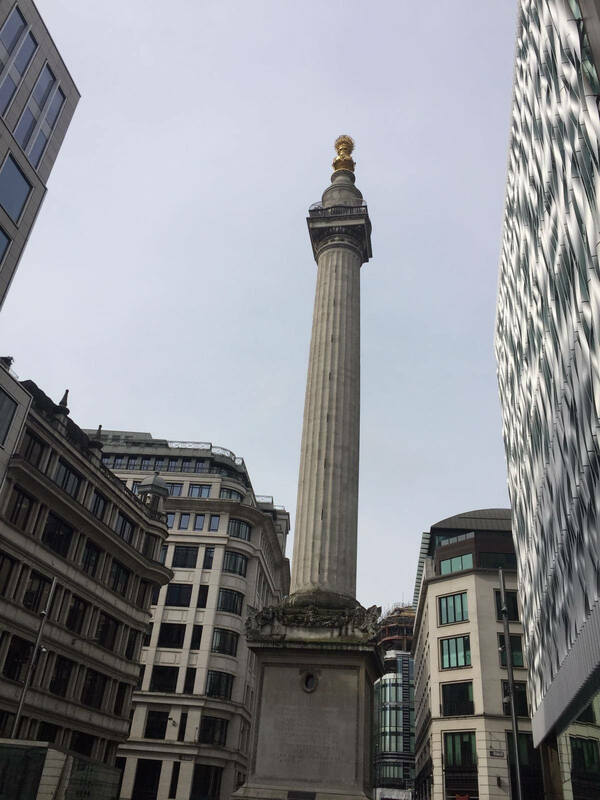 After a little stroll and a coffee and snack stop we headed back on the Underground to the Monument and Pudding Lane, where we took lots of pics for Oscar to take to school. 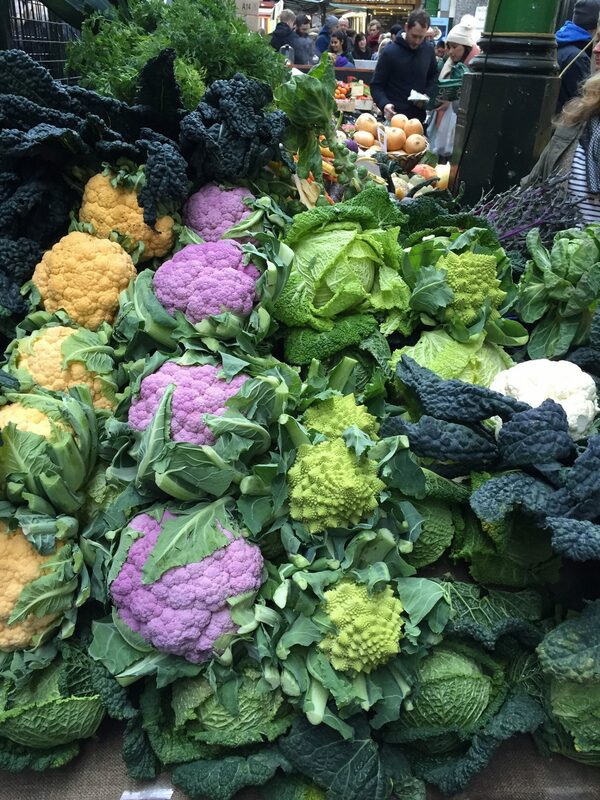 We then walked across London Bridge to Borough Market, which has to be one of my favourite places in London. When we arrived the kids all needed a toilet stop, so we found a little bar where we sat outside and had a cheeky glass of wine, whilst the kids enjoyed their fancy Japanese water (it was actually just tap water that came in a fancy bottle with Japanese writing on it!). It’s was a great people watching spot and with the sun shining, it felt like we were on holiday. 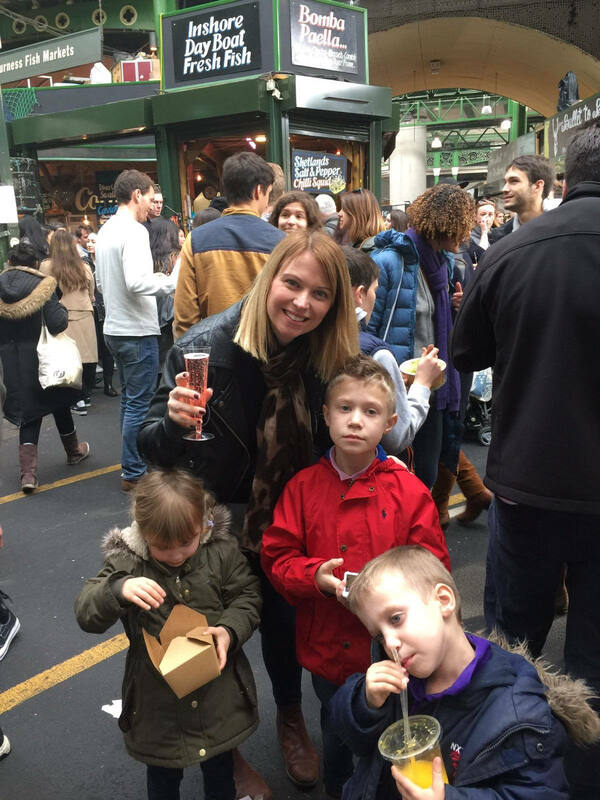 After our little pit stop, we had a stroll around the market and picked up some cakes to enjoy on the train journey back to Emily and Richard’s house. 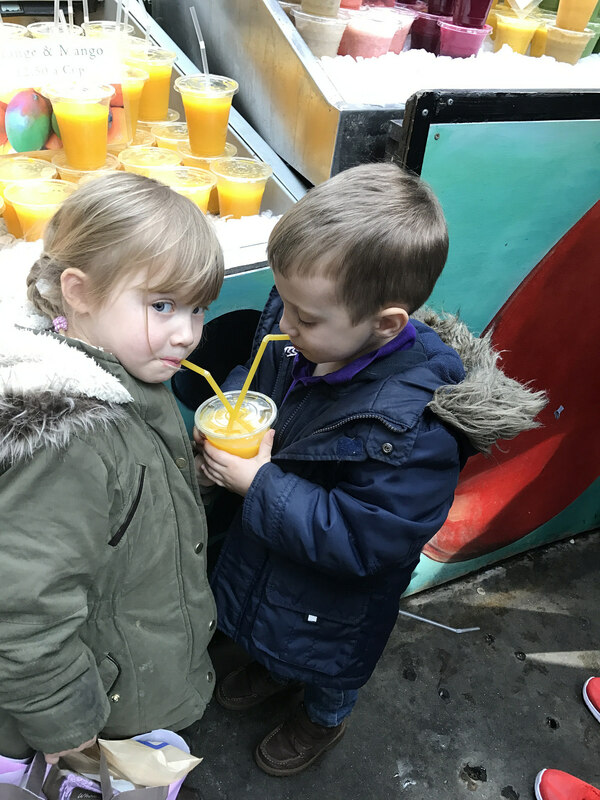 The kids also had a smoothie (and I may’ve had a little prosecco!). We then headed to a nearby Wagamama for lunch. Wagamama’s are the perfect lunch venue when you have three kids in tow – it’s quick, tasty and the atmosphere is generally quite laid back and loud! After lunch we were starting to get quite tired (well I was), but Oscar really wanted to visit the Natural History Museum, so we got the Underground from Blackfriars to South Kensington. The Museum was being updated, so it was different to last time we were there. We spent a bit of time in the earthquake and volcano section, as well as the dinosaur exhibit. 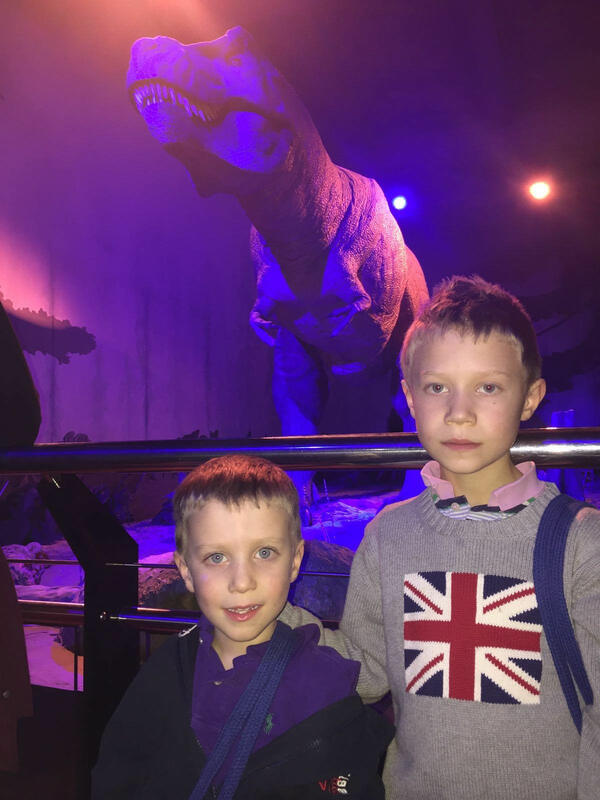 The boys loved the T-rex – Heidi wasn’t quite as keen as she was scared! I don’t think we really did it justice as we were starting to flag a bit. Next time, it would be good to start at the Museum. I quite fancy visiting the Science Museum too. After spending what felt like hours in the gift shop, we headed back to Euston Station, where we caught a train back to Hemel and munched on the cakes we’d bought earlier. I so was impressed with how well the kids did with all the walking, especially the twins. They never asked to be carried and really seemed to enjoy the day. It’s great that they’ve reached an age where we can take them on longer days of exploring and sightseeing. We’re going to Texas over Easter and we’re really looking forward to spending a couple of days exploring Houston and I’m feeling much more positive that the kids will enjoy it too. We had a fantastic time. 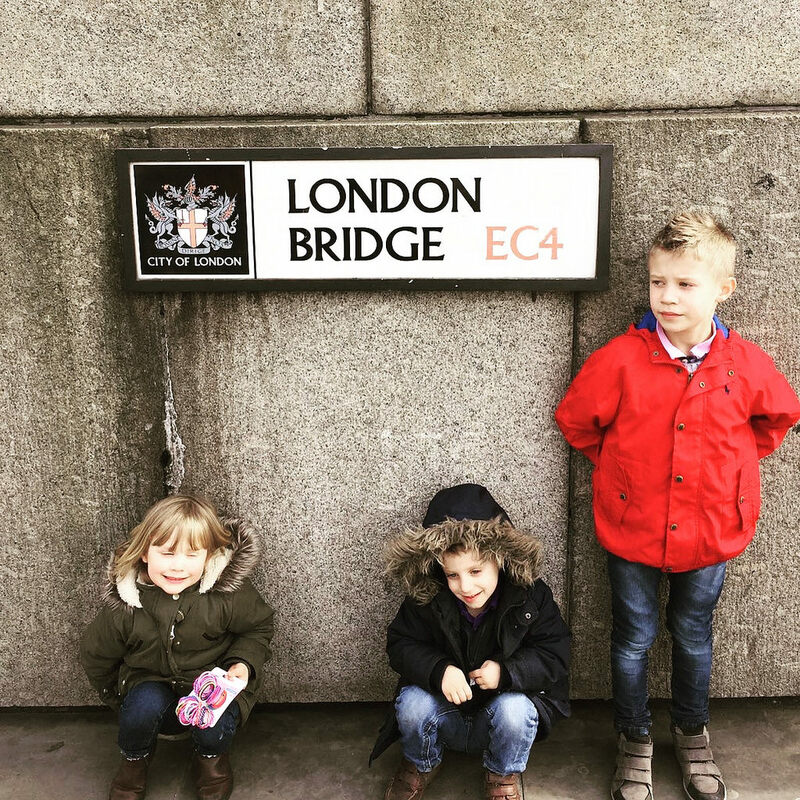 It was great being able to share the sights of London with the kids and they seem to really enjoy all of it, from going on the Underground to walking along the Thames. We actually didn’t spend loads of money either. Plus they were so tired that they slept really well that night, which is always an added bonus. Hopefully we’ll go back to London again soon. There’s so much to explore, although I think it’s worth not trying to do too much in one day, particularly if you have little ones in tow.